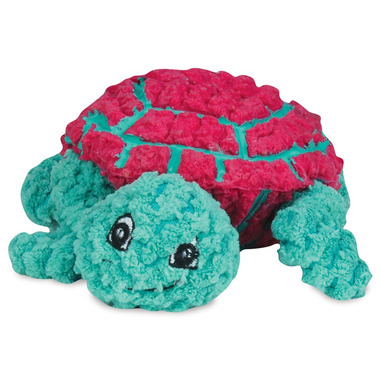 Hugglehounds' Dude the Turtle is made of a unique combination of Ruff-Tex, a thick walled, flexible, 100% natural rubber product and plush corduroy fabric. The head and tail are one long piece of material, as is each arm and leg. Dude has a loud squeaker. Your dog will love the two different materials in one toy. HuggleHounds Ruff -Tex is all natural rubber and are particularly good choices for tough chewing dogs. Latex has excellent mechanical properties for dog toys, and has outstanding resilience and tear resistance. Ruff -Tex toys are stuffed with polyurethane foam, which is environmentally friendly and contains no harmful chemicals. All paints used to enhance the toys are completely safe for dogs to play with, and chew on!